Let’s move on to the second floor! The walls are simply painted white, except the back wall, obvs. I used a bit of wallpaper from Chasing Paper for the back wall. 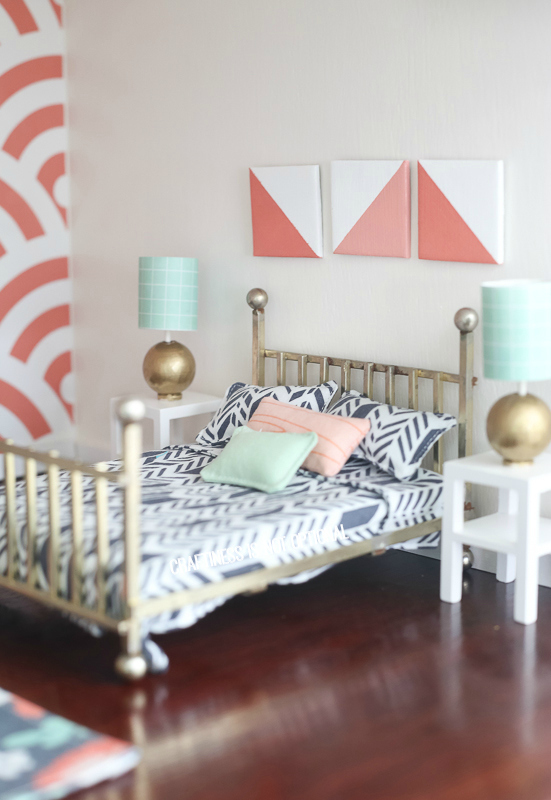 The vintage brass bed I found on Ebay, made the bedding with some fabric Kristin sent, and scraps from other projects. side tables came with the beds in the girls room. The rug I made with some of that journaling pack-I loved this print but it wasn’t a big enough piece of paper for the room. I scanned it in and uploaded it to Spoonflower, then printed a sample off in twill. Trimmed it down and hemmed the edges. Perfect! artwork from the journaling pack, cuckoo clock from Hobby Lobby, furniture from an ebay lot…painted with some gold stripes and accents! the dollhouse of course had holes cut out for the staircases, but I nixed those. I didn’t want to paint all of those steps, plus the placement was awkward and I knew my girls would never use them. So instead, I painted some thin sheets of balsa wood to look like rugs, then glued them over the holes. bam. PROBLEM SOLVED. the artwork is kinda a mish-mash of stuff that came with the house, paper from the journaling pack, and scrapbook items…plus a calendar cut from a rifle paper co pamphlet. dresser/vanity from that ebay lot. You know I had to. This one is wedged in front of the bathroom, I think the original plans for the house had this as a separate room with a wall, but that would make it hard to play with the room behind it (our bathroom), so I don’t know what they were thinking. It worked fine as a little sewing nook though! 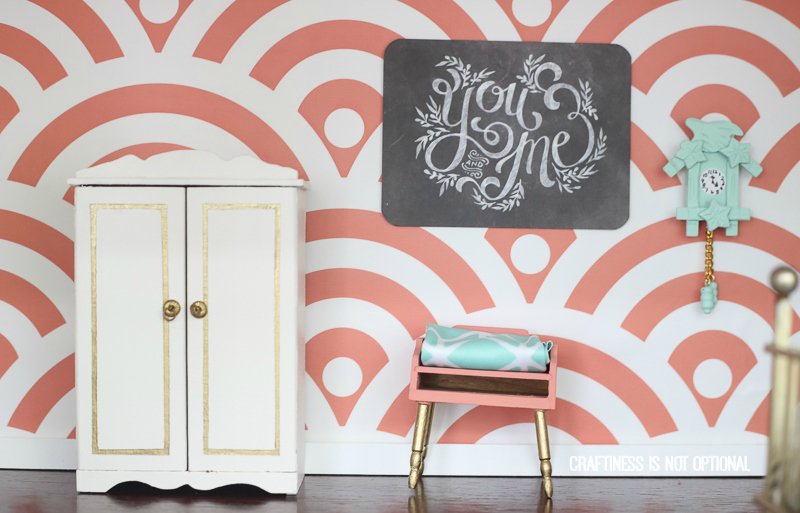 I used a stencil to “wallpaper” the walls…also, I found out I’m not great at stenciling. I made some bolts of fabric with cardboard and scraps wrapped around and glued. LURVE. I made the little SEW sign with some wooden letters and piece of wood. Covered some chipboard circles with fabric and paper for “embroidery hoop art”..hehe. I crack myself up. the little sewing form is from Hobby Lobby, as is the scissors, patterns, ironing things, and sewing machine. Some more paper from the journaling pack for the rug, chair cover…I recovered the ironing board with a joel dewberry scrap. Made the little gold table from craft wood and painted it gold with some mint on top, inspired by this desk. 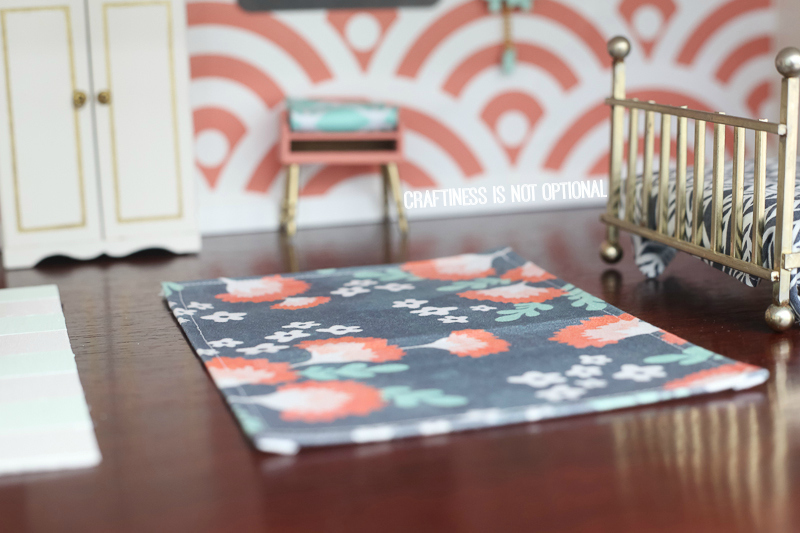 That ADORABLE tiny HAND SEWN hexie quilt was made by the lovely Rachel from Family Ever After! She got into the dollhouse spirit via instagram and offered to make one for me and it is perfection. I utterly adore it! the little shelf came with the house-I painted it and filled it with some tiny dollhouse bottles filled with tiny beads buttons. I painted some pieces of glue sticks (lol) to be paint bottles…and made some washi tape..ha! I love the little ribbon spool on the bottom shelf…used a q-tip and wrapped some small ribbon pieces around it then glued it into the shelf. printed off some tiny sewing machine art and placed it in a frame (also came with the house) thread case from ebay. the mirror is just a small round one from Michaels or Joann’s. the amazing hexie flooring is from here. I made the art from tiny canvases, tape, paint, and again, my silhouette and vinyl. I LOVE these! 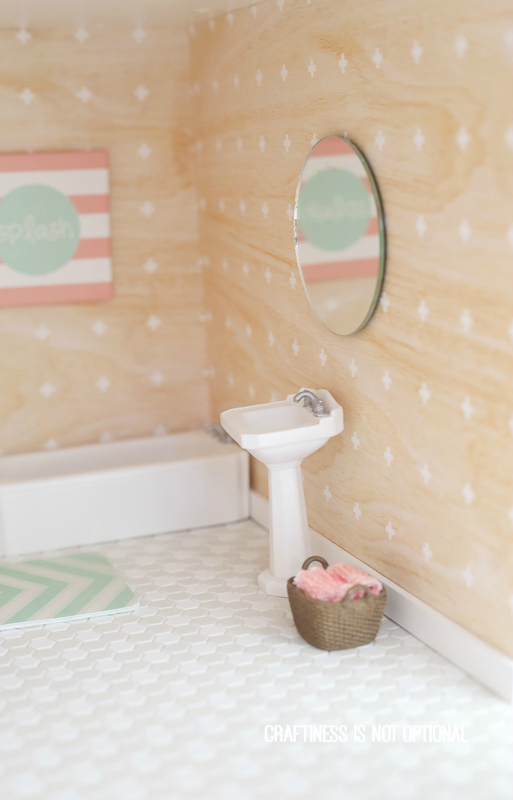 the little sailboat came with the house and I love that it matches the theme in here-what a cute little bath toy, right? Jessica sent me that awesome ornate frame (look for another one in the nursery! ), and I framed another piece of journaling paper. the rug is also from that journaling pack and is backed in felt. I made some towels by serging some small pieces of an actual towel (from target) and hung it on a towel rack. the scale came with the house. 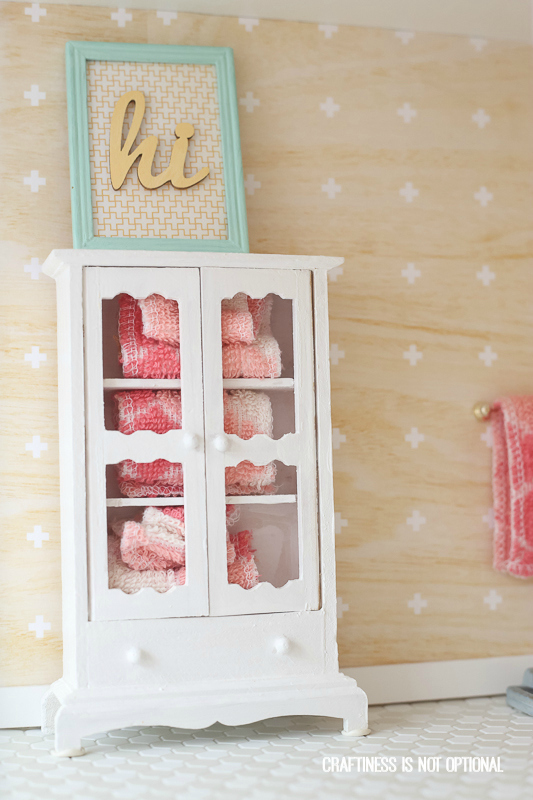 here’s where the rest of the towels live…this little hutch (came with the house) got a coat of paint and a cute HI sign on top. 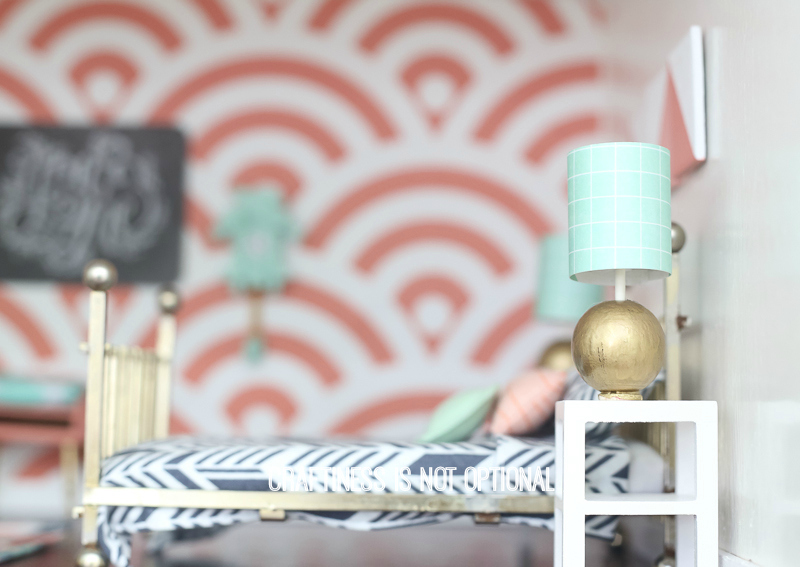 next up: The girls room and nursery! Yep…nicer than my real house! This is fricken adorable, Jess! I can’t believe the detail and personalization that you put into this. Too stinkin’ cute. 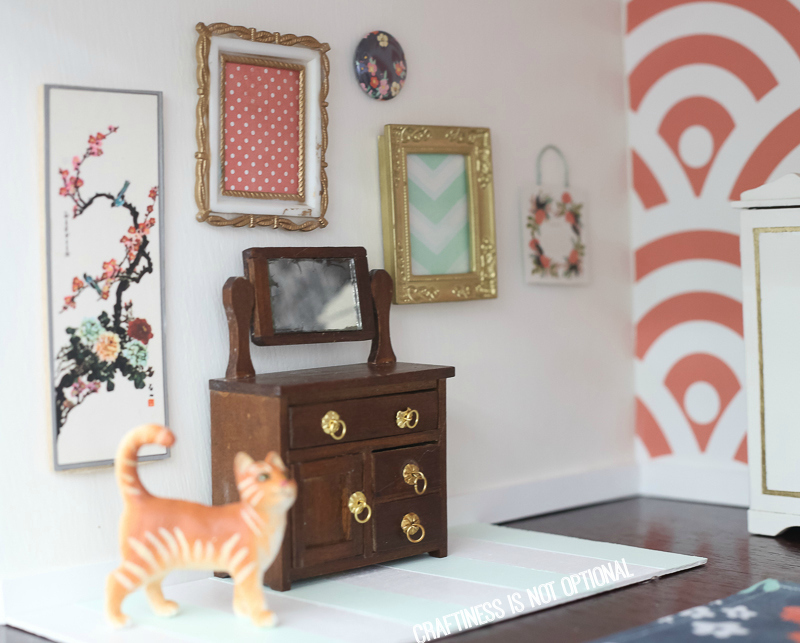 LOVE your doll house! 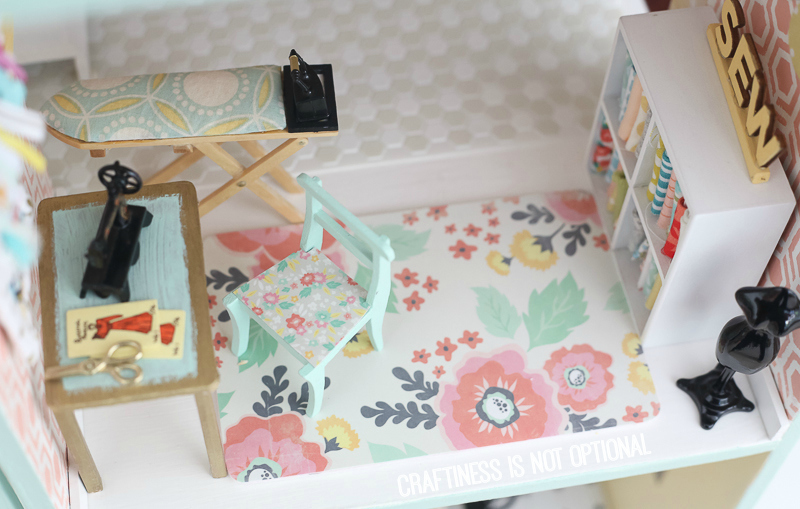 I had a doll house when I was a young teenager that I loved decorating, then I got older and lost interest. I always thought I would have one again. THANK YOU for sharing yours! brings back many memories (although mine was quite as adorable and perfect as yours) and makes me look forward to having another someday. Wow! This doll house is absolutely amazing! You’ve done such an amazing job with it. Ok, I’m trying to figure the scale out! It’s 1:12, right? This is the most beautiful, little house and all the details are amazing. I keep scrolling up and down looking at all your pics. You have inspired me. Last night I painted the exterior of my daughter’s twenty-five year old dollhouse. My granddaughters play with this house every chance they get. You have given me a tremendous amount of ideas for the interior of the house. What fun! Thanks for sharing. so cute! I am working on a really old dollhouse that I pretty much destroyed when I was 8 by trying to do what I am doing now… I have a question, do you take the house apart to paint it? Thanks for sharing, it is very inspirational! Thanks! I didn’t take it apart-just taped it off and painted! The sewing room is my favorite so far. Love. This is the cutest thing I’ve ever seen!! the bathroom flooring!! so good. and omigosh the sewing room is perfect. 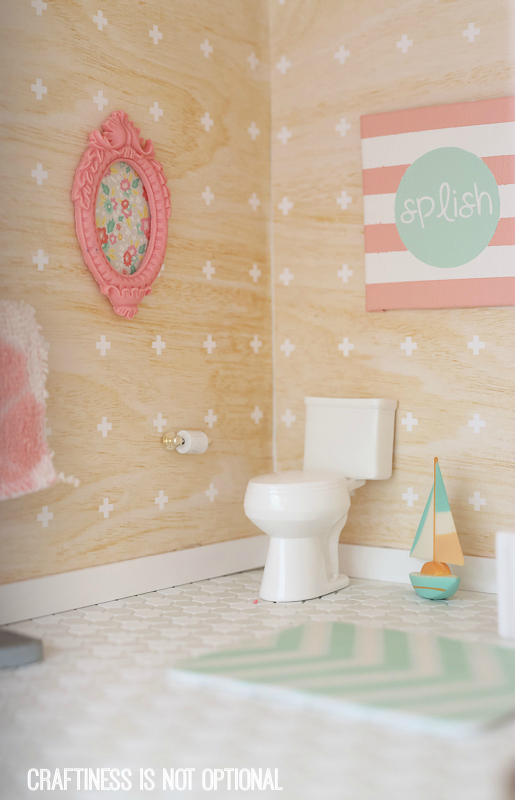 i love your dollhouse posts!! ..but seriously, stop making me want to build a dollhouse. I don’t have time. Holy stinkin’ cute! 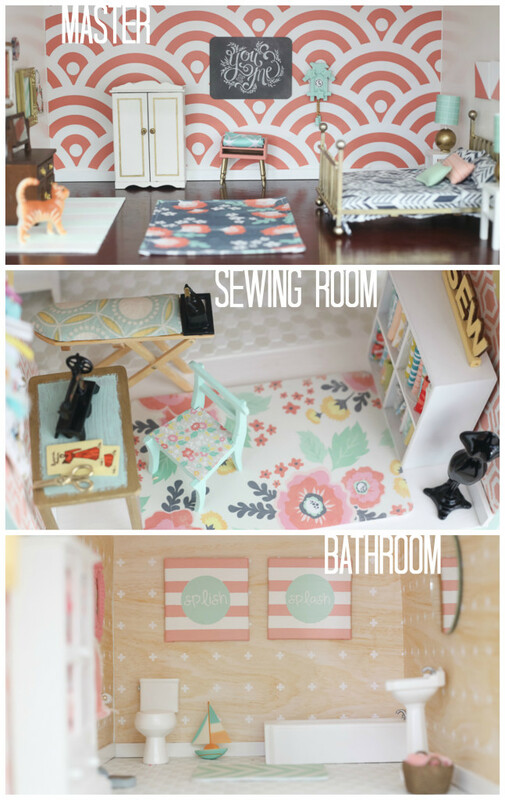 Oh my gosh, I want a dollhouse with a sewing room,heck, I want THAT sewing room! Love it!!!!! This is the most amazing dollhouse I have ever seen. It’s so cute! 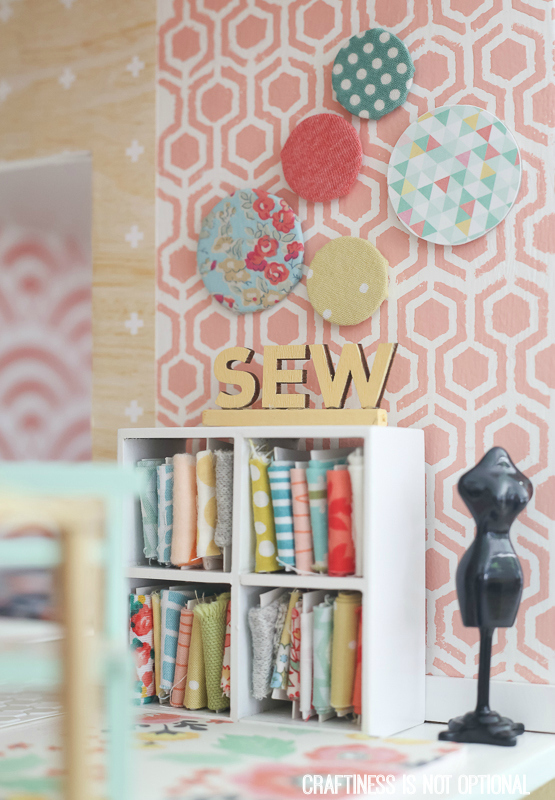 I love the sewing room. I’m working on redoing my childhood dollhouse for my daughter. This is so cute!! I love these ideas. I don’t know that I would be able to let me kids play with it. lol The pictures really are inspiring. 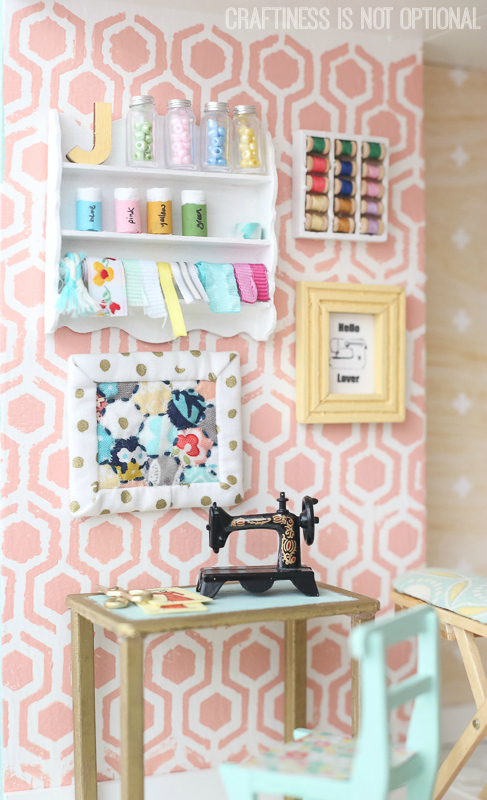 The fabric shelf is so stinking cute! Wow!!! What an awesome dollhouse! Where did you get the dollhouse itself?? So many neat things that you made for it!! I love this – it’s just beautiful. I wish I could live there! This is the cutest doll house I have ever seen. You are soooo creative! Where did you get the toilet paper roll or did you make it? if you made it please tell how. it came with the house so I’m not sure, sorry! 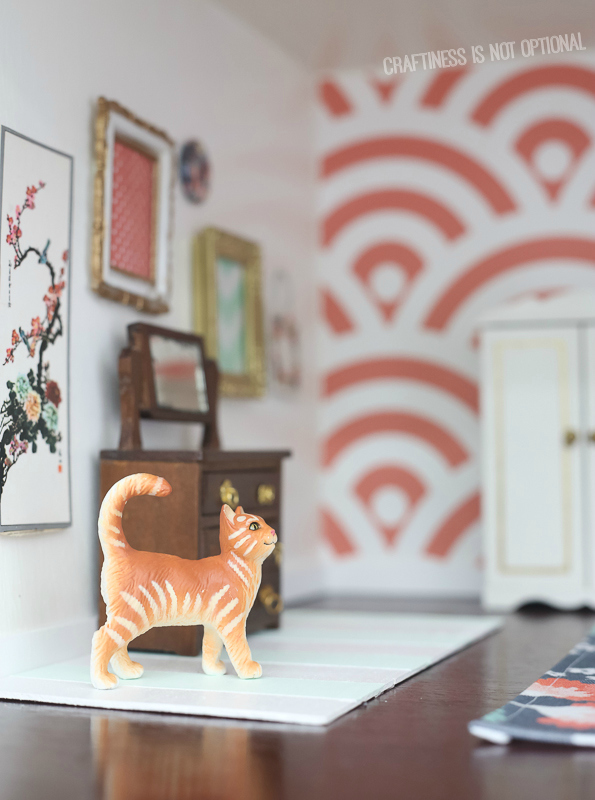 This dollhouse is amazing!! We just bought a kit to build one for our daughter and I love all the ideas you posted! Can’t wait to get started after seeing this (I might not feel the same way in a few weeks). This is adorable!! Great work. I am making one for my daughter’s birthday. The hexie floor link isn’t working – any chance you can post something similar? I realize it was from a few years ago! And maybe also share how you adhered it? I am clueless :). Thank you!